You might remember our little friend, Ava, who I have written about several times now. Ava was the Janeway Miracle Child last year, after taking her first steps and unexpectedly learning to walk right here with Andrew and I. I say "unexpectedly" because Ava was born with a condition that greatly limits her mobility. We were not sure she would ever be able to walk independently (actually, I hate to admit it, but we were pretty sure that she wouldn't), but Ava was determined and incredibly motivated and she proved us all wrong! There is no stopping her now! These are the stories I love to share - the stories of individuals who don't let their disabilities hold them back, who recognize their own potential, and prove that on the other side of fear is freedom! I am excited to introduce you to Alison - an incredible young woman who refuses to allow her physical condition to limit her lifestyle. She has so much energy and enthusiasm and confidence in her own abilities. Despite having the same condition as Ava, Alison has recently realized her dream of being able to drive her own vehicle independently. She has pushed the boundaries, not allowing herself to be limited by other people's perceptions or ideas of what she can or cannot do. 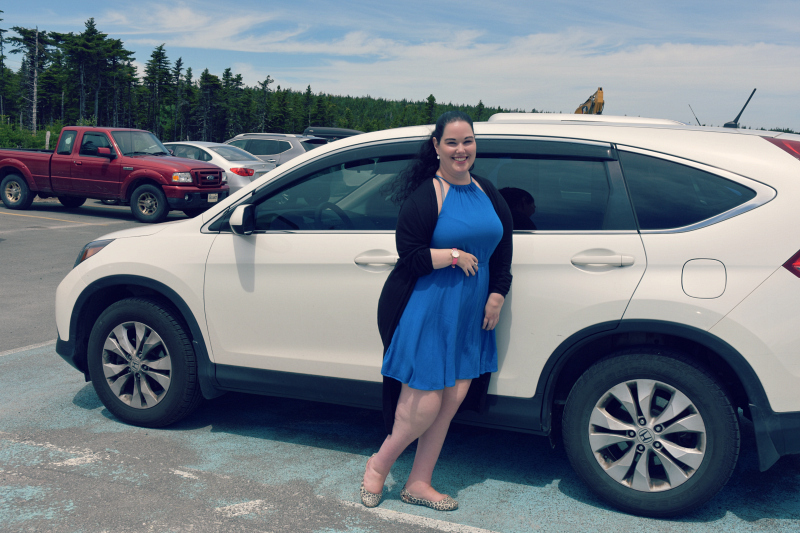 I had the opportunity to chat with Alison at an event that we both attended recently, and she was excited to show me her new vehicle. She was also happy for me to share her experience here on my blog because "it demonstrates truly how many opportunities exist for people who may need some support or help being creative and thinking outside the box." "My disability is Arthrogryposis Multiplex Congenita, which means that essentially my joints don't function the way I'd like them to. It hasn't prevented me from doing anything, though. There are some minor things that I'll always need help with, but I have traveled to eight countries, earned two degrees, and have had countless life experiences many "able-bodied" persons will never have! But driving didn't come as early for me as it did for my peers. I had always envisioned myself driving. It's never been a 'wonder' or a 'hope'. I knew I could do it, but I just did not know how it would be accomplished. Unfortunately, the options and possibilities are limited here on our island, so I did not receive a wealth of support or encouragement. While this was disheartening, I was still sure there was an opportunity out there. I was referred to Constance-Lethbridge, a rehabilitation centre in Montreal, where Occupational Therapist Dana Benoit and her team put my plans into action through their Driving Evaluation and Vehicle Adaptation Program. Within roughly an hour of meeting Dana, she had me driving two different types of vehicles independently. After merely two days, I had a vehicle fully designed for me to drive! The garage started their work, and two months later my accessible CRV was in my driveway in St. John's! The car is one-of-a-kind, and can be operated completely hands-free. My hands are most affected by my condition, so while one of the vehicles we tried did involve me steering a horizontal wheel, we decided on foot-steering. This way, the original steering wheel is intact and anyone else can get in my car and drive it 'normally'. My gear shifts are now buttons on the door panel which I hit with my elbow. The indicators are on my head rest. 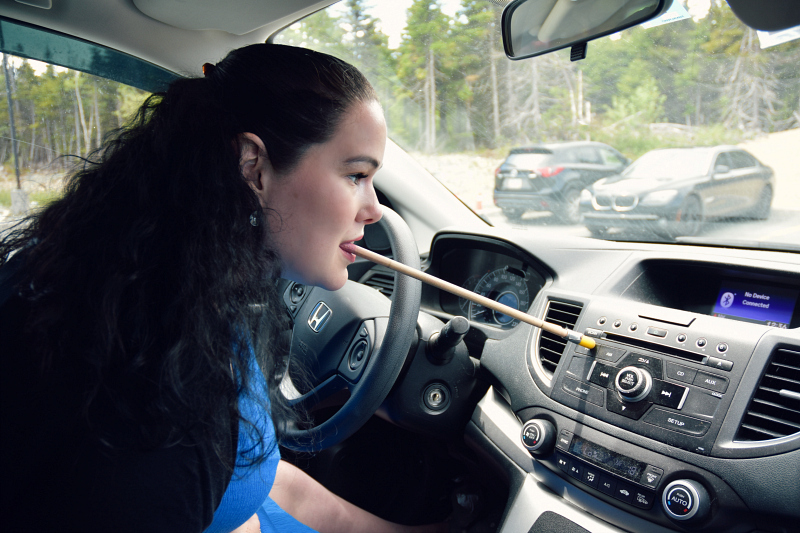 There are voice scan buttons on my arm rest, a horn by my knee, and a simple stick for things I can't reach easily, like the radio controls. Thanks to Dana, Jean, and Stephane in Quebec, my dream became a reality. There are not enough words to convey my appreciation to them. I am so much more independent now. I am even accepting a position in Gander to pursue my career in psychology and I can easily commute back and fourth as I wish! Alison, I am so very happy for you! I could hardly contain my excitement when you were showing me how you use your vehicle, just knowing how this opens up your world and creates so many more opportunities for you to have a full and fabulous life! There really is no limit to what you can do! I am the first to admit that I wasn't always so optimistic. Before Brennen was born, my experience with persons with disabilities was very limited - like, I didn't even know anyone who used a wheelchair, or who had limb-differences, or any sort of physical limitation. I am sure that I had some skewed belief that they were somehow less-capable, or unable to do certain things, but the truth is that we are all capable of so much more than we realize. Sometimes you just need someone to believe in you and to give you that chance. My perceptions have changed quite drastically in the past twelve years. I no longer view disability as an inferior human experience (I feel terrible even writing that!!). I hope that others are also able to replace their natural tendency of judgement with kindness and love, to look beyond differences and see people for who they are inside - for what they have to offer, rather than what they are lacking or how they are different. Beautiful! Where there's a will, there's a way.